I threw out the box with official bio quote months ago. In the G1 cartoon, Alpha Trion was a slender, peaceful looking wise old man. The TR figure bot looks radically different. 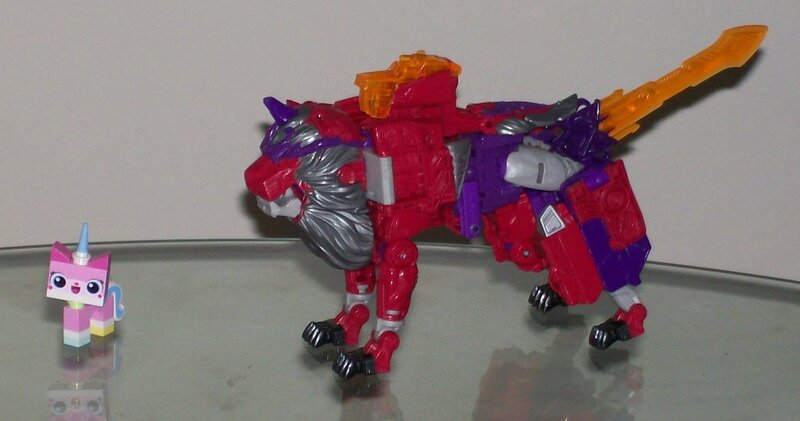 I don't remember what G1 AT transformed into, but I'm pretty sure it wasn't a lion. If you're OK with those differences, TR Alpha Trion stands on his own as very good toy. 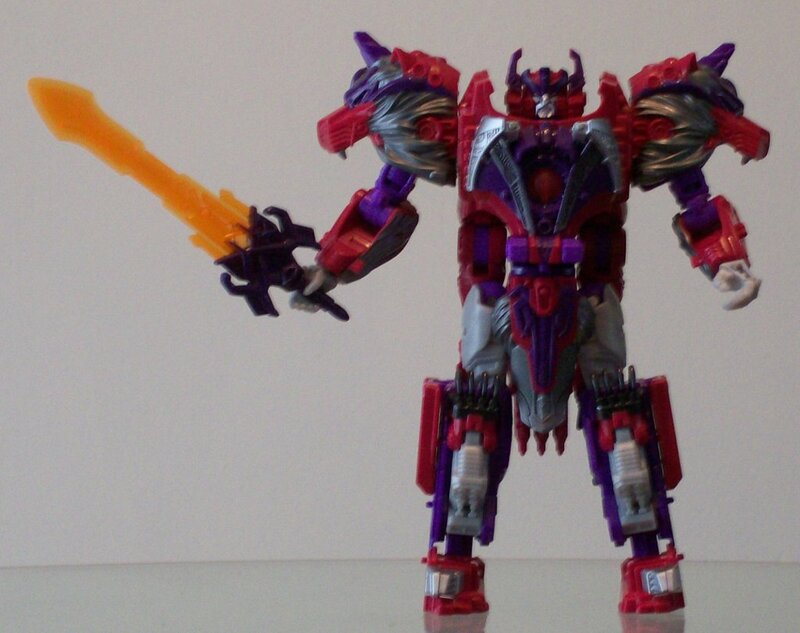 Robot Mode: Out of the box, Alpha Trion is a burly, noble-looking warrior. He looks like the type of medieval king who would lead his own troops into battle. The lion kibble on his shoulders and shins helps with this. He does share G1 AT's color scheme: burgundy, purple, and grey. The orb in his chest is red. Pressing this should raise his helmet fillers. But in mine, the helmet fillers won't stay down. I prefer the look of them up, but they do get in the way a bit when transforming to beast mode. The antennae resemble those of the G1 version, but give a much wider head. The arms have decent articulation. The shoulders and elbows each pivot on two axes, and the wrist rotates; there are no ball joints. The legs have 3 axes on the thighs and one on the knees. The crotch plate gets in the way, though. The transformation hinges in the ankles let you point his feet a bit, which can help getting him to stand. One nice touch in the bot mode is solid looking forearms. The hands don't fold in during transformation, so there's no unsightly gap like in just about every other TR figure besides Wolfwire. The official bot mode has the beast forelimbs folded up around the torso, giving AT a very boxy torso, which looks slightly out of place with his slender waist. Having the beast forelimbs dangle behind AT, and plugging the gun-seat into Alpha Trion's seat, provides a more tapered torso, and the effect of a knee-length cape. Beast Mode: The bot legs become the rear legs, the forelegs swing out from the torso, and the bot arms become the beast head. The beast is a lion with a horn. I like to imagine him saying Princess Unikitty quotes from the LEGO Movie. There's not as much variety as having Sentinel Prime say Trump quotes, but Unikitty is more pleasant. Unlike the TR Deluxe beasts, who have their cockpits integrated into their torsos, AT's cockpit sits atop his beast mode. You can actually tell if there's somebody in there. AT's sword forms the tail. Other weapons can be mounted on the hips. There's no real articulation to speak of here. There's some movement in the limbs due to the transformation joints, but not much. The ankles are hinged, so he will stand well in the small range of poses he can achieve. He does look rather regal standing there. 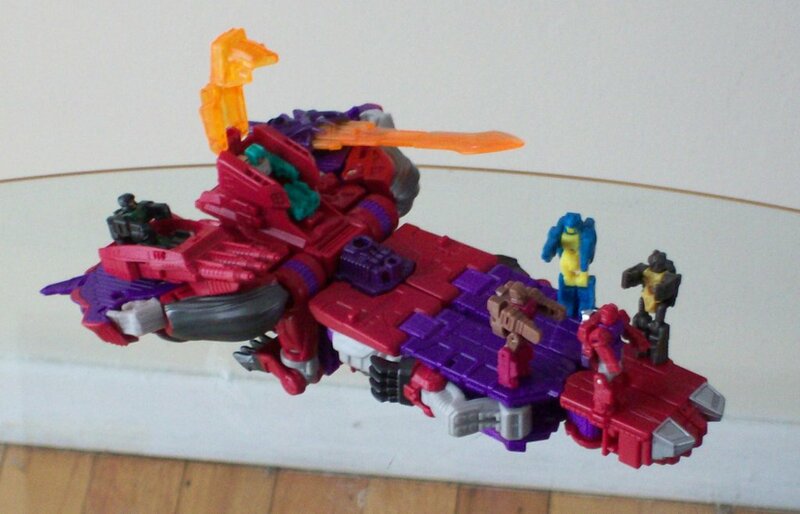 Vehicle Mode: What is ostensibly a space ship is clearly a slight reworking of Broadside's aircraft carrier mode. On the plus side, this means you can land small aircraft, like Apeface, on him. Or put Flattop there, and have him mope over the fact that he isn't a Broadside repaint. In a rare move for TR Voyagers, there are 4 TM pegs on the deck. With the cockpit and seat gun, AT can securely transport up to 6 little guys. Lion limbs on the sides have little cannons sculpted into them, so they look less out of place. The bot fists, however, are clearly visible. But, there are holes to mount weapons near there, which can block the view of the fists. The instructions have the bot arms folded flat against the sides of the ship, which looks pretty good. You can also fold the arms up like they are in bot mode, which lets you plug seat guns in while keeping the riders upright. This prevents him from shooting his own riders. Titan Master: Like many Titan Masters, Sovereign's face is unpainted. His QC is better than some TM's I've seen, in that his joints are tight, and his foot holes fit TM pegs well. Transformation Design: 9/10 The way the bot hands become the beast jaw, with the sculpted fingers looking like neatly combed fur, is clever, and eliminates the need for hollow forearms. The bot arms/beast head hang off the sides of the vehicle mode like chunks, but the fit in better than most chunks I've seen. Durability: 8/10 The overall figure seems pretty solid. But, the spring-loaded helmet fillers were broken out of the box; they won't stay down, which makes transformation to beast mode difficult. One of the beast forepaws comes off far too easily. It also clips back on easily, but over time, this may wear out and not stay on at all. Fun: 9/10 Of the dozen+ TR figures I've bought over the past couple months, Alpha Trion's the one I pick up the most. Aesthetics: 9/10 The bot arms look out a bit out of place in vehicle mode, especially the visible fists. The proportions and colors are excellent. Articulation: 5/10 The bot mode is adequate, not great. The brickish beast mode lowers the score. 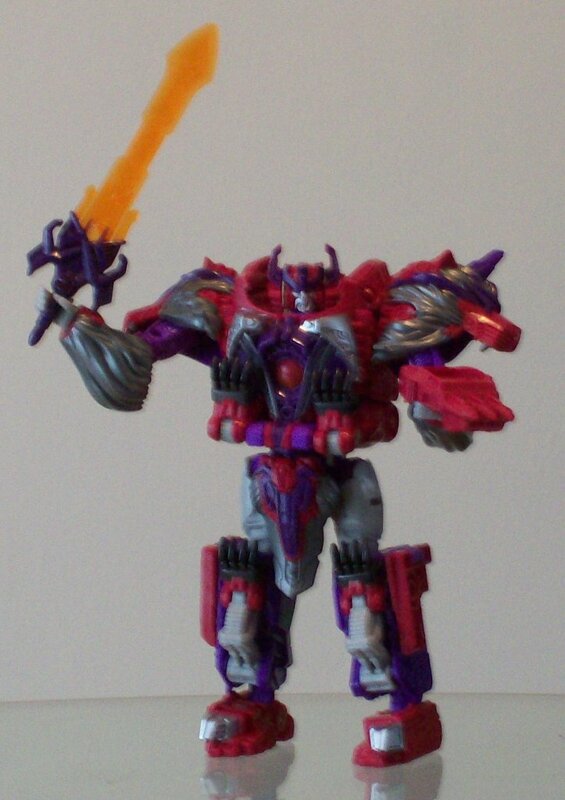 Personally, I'm happy with decent arm articulation, which Alpha Trion has, so I'm not too bothered by this. If articulation is more important to you, you may want to knock a point or two off the overall score for this. Price: 8/10 US$25 retail is the going rate for Voyagers. From my experience with TR Astrotrain, and reading about Sentinel and Galvatron, AT looks like he provides the best value of the TR Voyagers so far. Overall: 9/10 The flaws I've mentioned (non-retracting head gear, negligible beast articulation, bot/beast kibble on the sides of the vehicle) mean he's not a perfect figure, but he is very good. However, if you want a toy that represents G1 Alpha Trion, get the Kreon.